I am loving all of the fresh fruit available at The Red Barn right now. I found another recipe from my favorite cooking website, Real Mom Kitchen. Laura does an excellent job preparing and photographing fantastic food that can be made with ingredients most of us have on hand. So without further delay, I bring you Blackberry Cheesecake Cups! Preheat oven to 350º. Crush the graham crackers to create crumbs. Add melted butter, stir well to combined. Spread on baking sheet. Toast in the oven 3 – 5 minutes until crumbs start to brown. Cool. Process the cream cheese, sugar, cream and vanilla in a food processor until smooth. Add half the blackberries and process until just crushed. 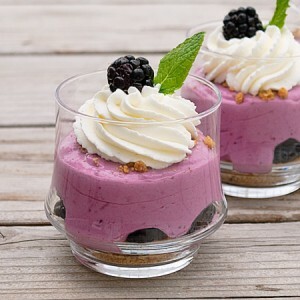 Spoon a half of the graham cracker crumbs into four 1/2 cup-capacity dishes, layer on a few blackberries. Divide cheesecake mixture evenly between the dishes and top with the remaining graham cracker crumbs. Garnish with whipped cream, blackberries, and mint (if desired). Refrigerate for 1 hour or until firm. Serves 4. Combine all ingredients in a medium sized mixing bowl and beat until soft peaks form. *This recipe would also be great with raspberries or blueberries, or a combination of all three berries!